Great hostel! Met some awesome people, heaps of activities offered, staff were really helpful (when I had no idea where to go next! ), rooms were clean, secure and there was a great kitchen! Couldn’t ask for more in a hostel! Great friendly clean place to stay. Comfortable beds. By far one of the best hostels I’ve stayed at! Well set up, with great secure storage under your bed and a fabulous social area, both inside and outside. The added bonus of discounts on outdoor activities and easy booking really made the trip. Short walk from the centre of Bovec with restaurants/grocery store. Highly reccomend! This hostel is great! It’s in the most amazing location and has a bar and kitchen in the hostel. The beds are comfy and it’s very reasonably priced. Loved our stay here! The staff is so friendly and the location and adventures offered are great. This hostel is great!!! The staff are so, so friendly. They even lent me sunscreen when I needed it! 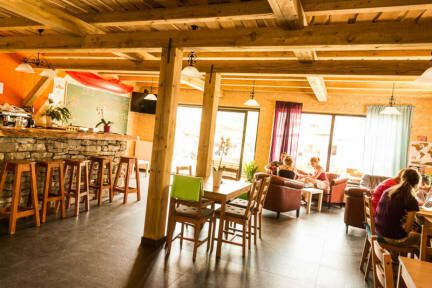 The atmosphere at this hostel is great and it’s in a perfect location to see the highlights of Soča Valley. If I don’t go camping when i come back to this beautiful country I would definitely stay here again. The only thing that needs improvement is the wifi does not work very well at all & it would probably be a good idea to add individual lights to the beds. This was such a great hostel - the best thing amongst the affordable bar, great location and helpful staff is that this hostel owns an activity company so you can book all your rafting, zip line, canyoning experiences through them easily! Comfy beds, spacious kitchen, and lots of information for bike rides or hikes. We had such a great time in Bovec! Techno music non-stop. Totally inconsistent with the beautiful environment and especially during OFF SEASON. I'm all for music, good times, boisterous talk... However, I'm also for mutual respect. Didn't get any from the owner.... So if you have a problem or concern, expect the same. For those moments where you need to work on your laptop and feel the need to get out of your dorm room, which faces directly onto the regularly busy roadside, you'll be out of luck. Three nights and money wasted.